I have always resisted a 2" diagonal on an 8" sct. The main reason being not to alter the focal length and introduce SA. But the Edge 8 has a long visual back and I was wondering if an sct type 2" diagonal screwed in place of the stock 1.25" visual back would end up being about the same length light path as with a 1.25" diagonal in the stock visual back? The 2" Diagonal won't be much more however even if it was the effect is minimal. I possess and use a 2-inch mirror diagonal on my 8-inch EdgeHD, and it works well even with my 30mm Explore Scientific 82 degree eyepiece. No issues with image quality are to be seen. Thanks. I don't have any 2" eyepieces so I want the 2" diagonal for mechanical reasons such as a generally more solid diagonal lock up to the OTA. But who knows I might get a ES 30/82. I have a ES 24/68 and like it a lot plus a ES 14/82 and 8.8/82. All you need is an inexpensive 55mm Plossl and you will have the maximum FOV availble in your scope. If you decide you like the wide view you can upgrade to a higher end wide field EP later. I put the Celestron 2" SCT diagonal on my non-Edge C-8. It is solid, convenient and optically excellent. It doesn't look like it increases the back focus much compared to the 1.25 inch diagonal in the visual back. Perhaps not at all. I have gone to almost all 2" eyepieces and find this consistency very handy. I don't like fumbling with adapters in the dark. The one 1.25 inch eyepiece I use lives with the 1.25 to 2" adapter on it. It sound like you will want to let the 1.25 inch adapter live in the 2" diagonal. That will work fine and your eyepieces will only see the optically perfect center of the diagonal with no edge figure effects. 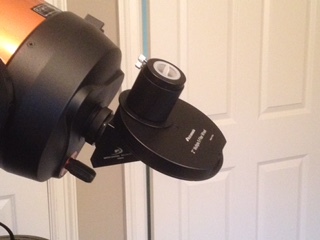 I use a Highpoint Scientific 2 inch SCT diagonal with a 31mm Nagler with no problems at all, works excellently. I use 2” diagonal and 2” EPs with both my edge and non edge 8 SCTs. Works superbly with Edge and actually pretty well with the non-Edge scopes as well, even the ES 82 30mm. I would highly recommend the Celestron 2” XLT SCT diagonal. I have obtained very good results with it. The sobering and reassuring answer I received from a fellow CNer, when I was OCD’ing over the back focus issues with my newly acquired C9.25, was that the magnification you typically get with big wide-field 2” EPs is so low, that even *if* (a BIG *if*) there were any additional SA, I wouldn’t be able to see it. How right he was! The advantage of the wide field with 2” EPs in an SCT vastly overcomes the somewhat irrational fear of introducing slight additional SA by adding, what, maybe 20-30 mm of back focus. So go for it! And if your OCD is as bad as mine, you can quite easily test for possible additional SA, by comparing the secondary shadow breakout and size at 10 waves of defocus on both sides of focus with both 1.25” and 2” diagonals. FWIW, results in my C9.25 were pretty much identical (just a visual comparison since I don’t have a camera for the scope). Ever since, I’ve only used 2” VB and diagonal, also with 1.25” EPs. *If* you think you see less SA with 1.25” accessories, it’s trivial to swap to those for critical high mag planetary work, and use 2” stuff for DSOs. Edited by Axunator, 27 August 2018 - 12:12 AM. A 1.25 diagonal plus the adapter supplied with the scope may in fact have a longer back focus length than a 2inch sct diagonal which threads on without the adapter. The difference would be negligible. The 2inch diagonal offers stronger support. I agree with Doug. I added a 2" Baader Clicklock VB to my Edge 8, it is shorter than the standard 1.25" VB by an inch. I added a 2" diagonal and the light path is almost exactly the same length. I no longer worry about the diagonal and EP falling out of the VB when the scope is aimed high, and the 2" VB holds larger extension tubes for AP. Edited by Luna-tic, 27 August 2018 - 06:25 AM. I use the Baader 2" BBHS-Sitall diagonal and the Baader 2" clicklock visual back with my EHD8 and have had no issues with them so far. The optimum back focus of an 8" edge hd is longer than a standard 8" (about 130mm vs 100mm). An SCT 2" diagonal should be about right in terms of SA correction. If memory serves me, optimal SA correction is at about f/10.4. Even on a standard SCT the amount of negative SA causes by a 2" diagonal is minimal. You can see it in a star test, though. Unlike coma, SA shows up on axis, so I'm most worried about it at high power, not at widest true fields at low power. I use a 2" diagonal most of the time in my 8" non-Edge, but I do revert back to a good 1.25" prism for planetary when conditions are good. 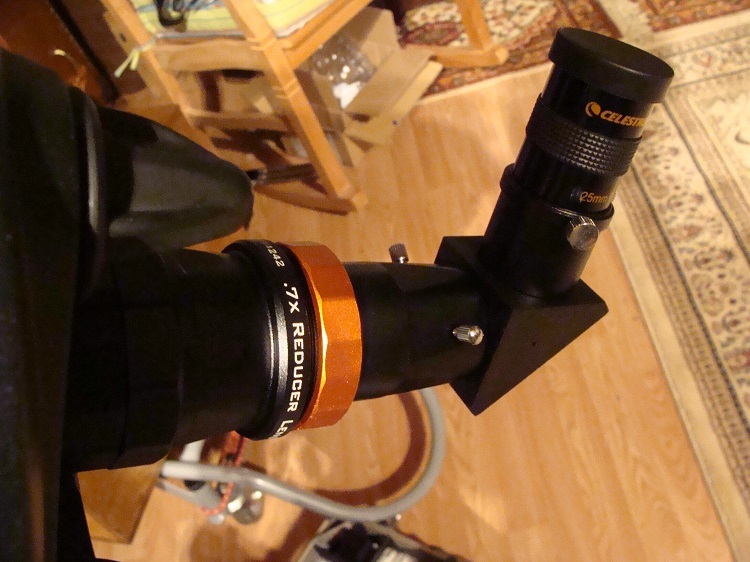 I have not noticed any SA with my Celestron 2” XLT SCT diagonal on either my Edge or non-Edge scopes. 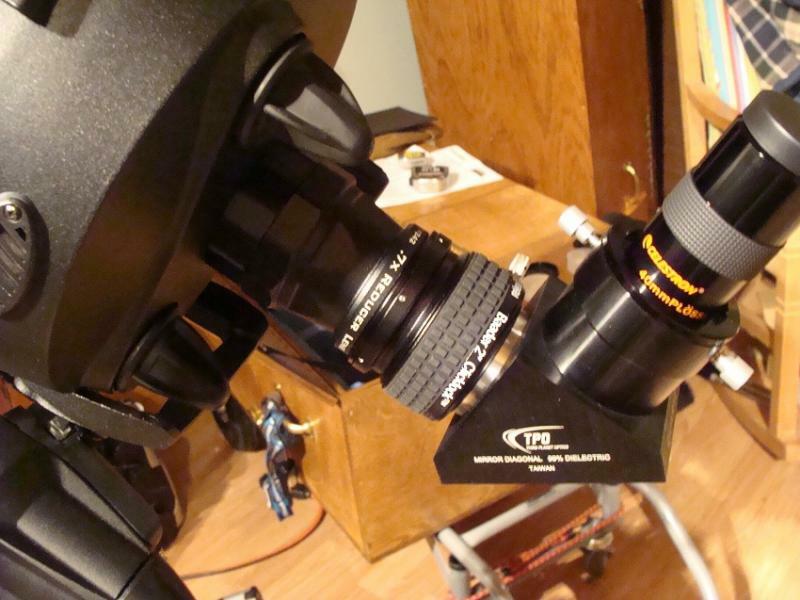 I believe the Celestron 2” SCT is designed specifically for use with SCTs. So, I would be surprised if this is the case. I owned an 8SE with the standard C8 tube. To it I added a 2" sct-style diagonal and also fitted a 2" filter wheel to the eyepiece side of the diagonal with adapters to minimize added focal length. I've attached a photo showing the arrangement. On a couple of occasions I performed drift tests to determine the resulting focal length and averaged around 2250mm. This suggests I added about 70 mm of back focus. With my widest TFOV eyepiece I saw some distortion of stars in the outer portion of field which required some refocusing to sharpen the outer stars while softening the inner field. Somewhat annoying, but I really enjoyed the wide field views. It seemed that the high magnification views were not impacted either way other than to provide more magnification for a given eyepiece. I've now replaced the 8SE with an EVO 8 EdgeHD. My measurements suggest that the back focus will be about 1/2" longer using my 2" diagonal/filter wheel vs the stock 1.25" visual back and diagonal. The new visual back is about 1.5" or so longer than the one supplied with the 8SE. I plan to do some drift tests soon to better quantify what's going on. But my initial experience with the 2" set-up and same wide field eyepiece (Baader Aspheric 36mm) shows crisp stars across the field. So I'm optimistic that there will be no significant deterioration of the view from the slightly longer focal length. I'll update this with drift test results using the 1.25" and 2" set-ups, along with any further comments about the quality of the view. Notice that Celestron doesn't offer a long 2" visual back and 2" barrel type of diagonal, only that nice 2" SCT XLT model which places an eyepiece field stop at about the same point as the 1.25" visual back and diagonal combination that is supplied with the regular SCTs (up to and including the C11). There is a bit of a difference, though. The stock 1.25" diagonal is a Prism, and the 2" XLT SCT Diagonal is a Mirror. The light path in a mirror is different from that of a prism. I use the Baader Clicklock visual back on my 8" Edge, along with a 2" diagonal. I think it adds a little focal length, but not much since the stock 1.25" visual back is pretty long. I haven't noticed any image quality issues as a result of this setup. True, and between just the two diagonals there is quite a bit of difference ... but you have to subtract the distance added by the 1.25" visual back since the XLT diagonal closely couples directly to the SCT threads. So the distances are actually closer than many would first imagine. I finally had an opportunity last night to perform some drift tests to determine the focal length of my 8 EdgeHD. My results were about 2160 mm +/- 20. This is about 90mm shorter than I had measured with the same diagonal/filter wheel on my 8SE. It is also about what I expected from my measurements of the 2" set-up vs the stock 1.25" visual back and diagonal. I had measured the 2" setup to be 1/2 inch longer than the 1.25". So 12.5mmx3 +2125 ( focal length stated in White Paper) = 2162mm. Plus I've notices a broader field of view on some favorite wide field targets such as M81/82 and the double cluster that seem to line up with the numbers. That is a sweet eyepiece, despite the large size and weight. I have pretty much decided to get a Baader 2” clicklock diagonal to use with clicklock back on me edge 8, but am unsure on which model to get. Is the difference between the standard model and the bbhs significant enough to justify the additional cost? I don’t mind the extra cost too much if there is an improvement for both visual and AP. I have another what may be a dumb question, that I think I already know the answer to but here it goes. Can an edge 8 F.7 focal reducer be used with a nosepiece with the clicklock back, or would the focal length differences ruin the functioning of it? If I can simplify adding and removing accessories in dark and cold environments, I’d like to. Obviosly I’m still very much in my “lift off” stage, but loving the journey.